This tiny house with versatility (or 4 season chalet) boasts a minimalist approach to meet the growing demand for rustic style homes and chalets that are above all affordable. 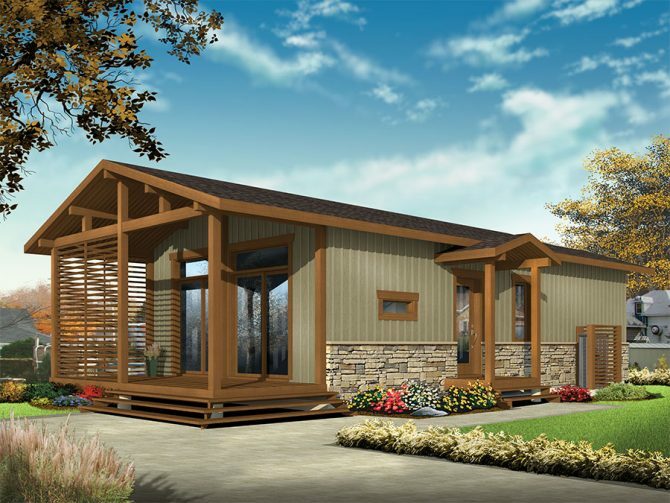 Whether as a main residence or a fishing and vacation cottage, Opal’s efficient design is sure to meet the needs of those who want a warm, comfortable home with an adaptable style and enhanced versatility. Opal is an economical tiny house / chalet with an efficient and flexible layout that’s full of surprises. Future home owners will find that it’s a perfect fit no matter where it is to be built, either in an urban setting or in the country. The main entrance on the side opens onto a large closet and the laundry area, with room for a stacked washer / dryer set, is just down the hall. 9’ ceilings throughout, with a slight slope in the living room, give the illusion of added space. The main living area can be located either in the front or the back of the home, depending on how the owners choose to orient the floor plan. Access to a large, covered deck through double patio doors adds dimension to the view and increases the living space during warmer months. The kitchen area is large enough for a table that seats 4 – 6 but this could easily be replaced by a kitchen island / lunch counter. The living room could even be converted into a 4th bedroom if need be and is large enough for a 3+ seat sectional sofa and standard TV stand. Bedroom #2 is the most versatile room in the house as its retractable wall permits the occupants to either enlarge the living room or to use it as a home office with a wonderful view outside. If furnished with a “Murphy” bed it can even be used as a guest room when necessary. The bedroom area is located at the extremity thus providing a quiet, restful area conducive to sleep. Bedrooms #1 an #2 are large enough for double beds and the master bedroom can even accommodate a Queen size bed and furnishings. The full shower room is located in the center of the floor plan and the crawlspace foundation provided can lower construction costs but we would be happy to provide a free estimate for an alternate foundation if required.